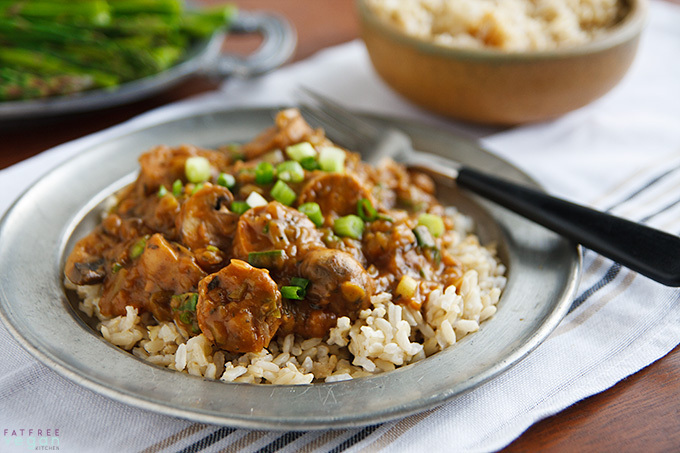 Creole and Cajun food doesn’t have to be loaded with meat and fat to taste decadent. This vegan etoufee is stuffed with all the spicy flavors of Louisiana. I’m writing this from a hotel on St. Charles Avenue after a night of revelry in the streets of New Orleans. If you’ve never been to Mardi Gras, you might assume that the partying is confined to Fat Tuesday itself, but Mardi Gras day is just the culmination of all the parties and parades that have been going on over the last couple of weeks. Yesterday, out on the street for over twelve hours, my family and I were able to catch six parades (and a couple of bags of purple, green, and gold beads). Tonight we’ll be back out there for four more, and we’ll stay to see Zulu and Rex on Tuesday before we return to real life. You would think that because we’re in New Orleans we’d get to sample a lot of great New Orleans-style food, but the truth is that, though N.O. has become more vegan-friendly over the last few years, there don’t seem to be many restaurants that offer meatless versions of gumbo, etoufee, or even red beans and rice. While we’re here, we’ll seek out great Vietnamese food or maybe Tapas, but we won’t be able to find Eggplant Creole. Last week, in anticipation of our trip, I began craving spicy New Orleans food, and since I knew I probably couldn’t get it here, I made it myself. 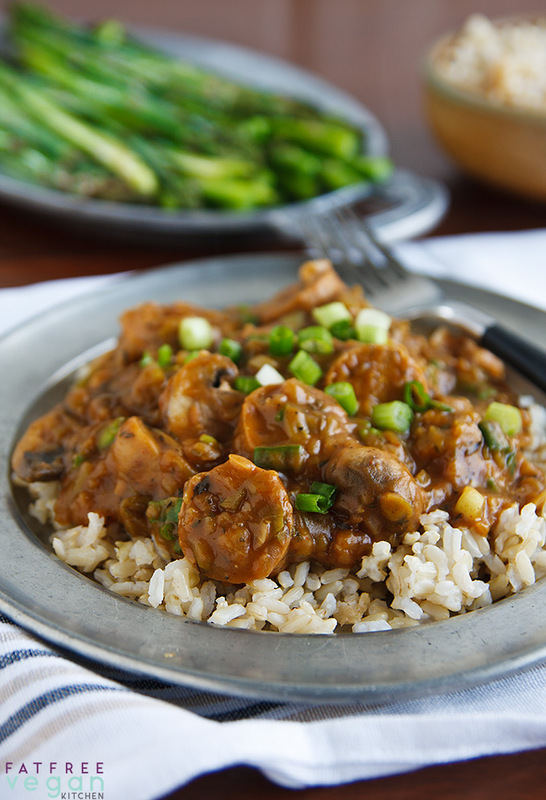 Étouffée is basically seafood (usually) or meat cooked in a thick gravy that begins with a roux, a mixture of flour and oil that is cooked until it turns a rich brown color. Then the Louisiana trinity is added–onions, celery, and green pepper–along with broth and herbs and lots of red, black, and white pepper to achieve a sauce so flavorful that you could probably cook an old non-leather wallet in it and have it come out delicious. 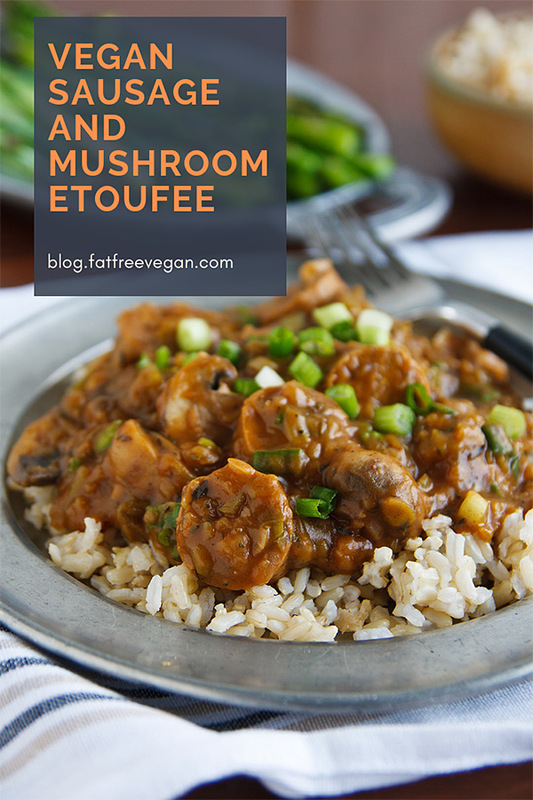 Making a vegan etoufee is easy–just use vegetable broth and non-meat protein–but making a fat-free etoufee is a little more challenging because the roux that gives it the rich, smoky flavor requires fat. Or does it? As it turns out, you can make a great “dry roux” just by browning the flour alone in a dry skillet. Like any roux, you have to stir it nearly constantly and make sure it doesn’t burn, but once it’s browned and blended with vegetable broth, it forms a thick, flavorful gravy that I, at least, prefer to an oily traditional roux. I don’t usually use a lot of fake meats, and when I do, I make them myself. But since Mardi Gras is all about excess, I went all out and used a processed vegan sausage for this etoufee, and I have to say, it was one of the best, most decadent-tasting dishes I’ve made in a long time. I hope you’ll give it a try for a little taste of Mardi with not so much of the Gras. Gluten-Free Friends: Obviously, this recipe is not gluten-free as written, but I’ve heard that people have had good luck making a roux from Bob’s Red Mill Gluten-Free All Purpose Flour Blend. Just use it to replace the flour, and brown it the same way. As for the sausage, you could try replacing it with cubes of baked tofu or tempeh or use red beans. And don’t forget to substitute gluten-free tamari for the soy sauce or use salt instead. If you’re looking for more vegan Mardi Gras dishes, check out all my Vegan Louisiana Recipes. A quarter teaspoon each of the cayenne, white, and black pepper will probably provide enough heat for most people, but if you like your food fiery, add more to taste, but try to keep the amounts balanced. If you don’t like spicy dishes, start with 1/8 teaspoon of each pepper and build up from there. Put the flour in a small skillet and heat it over medium-high heat. Cook, stirring almost constantly, until it is the color of light brown sugar, about 15 minutes. Be very careful–it burns easily if not stirred. If it burns, throw it out and start over again. When it reaches the right color, transfer it to the blender, add the broth, and blend it until smooth. Set aside. While you’re stirring the flour, you can begin cooking the vegetables. Heat a large non-stick skillet. Add the onion and cook for about three minutes, adding water by the tablespoon if needed to prevent sticking. Add the celery and bell pepper and continue to cook until the onion is beginning to brown. Add the mushrooms and a tablespoon of water and cover tightly. Cook until the mushrooms begin to exude their liquid, about 3 minutes. Add the garlic and cook another minute. Give the flour mixture another quick whirl in the blender and add it to the vegetables. Add the soy sauce and all the seasonings and cook, stirring often, until sauce has thickened. Reduce heat and add the sliced sausage. Cover and cook on low for about 15 minutes, stirring occasionally. If the gravy seems too thick, add a little more vegetable broth. Check the seasonings and add more pepper and salt if needed. Stir in the green onions and serve over rice. Nutrition info below is per serving, using Italian Fauxsages. Nutritional analysis will vary depending on the type of sausage used. Sounds delicious! Going to try to make this tonight. One question though, if the flour is bleached will that affect the browning? Not sure what I have at home and trying to determine my shopping list. Also, what is the purpse of putting the dry roux and broth in a blender as opposed to just mixing thoroughly? Thanks! Bleached flour will work just fine (that’s what’s traditionally used). The reason I blend it is to get out all the lumps that can form when you add the flour to the vegetables in the skillet. It makes it much smoother and fool-proof. That dish looks so delicious I’m gonna add it to my “to try” list of recipes! So were any of the restaurants you found worth sharing? I’ll be down there in 2 weeks for the marathon and I’ll admit I’m a little sad to be skipping some of my favorite haunts this time (I’m making a guess that Cafe Du Monde beignets are not vegan-friendly). I need to find some new favorites! That looks amazing. I have a new jambalaya recipe int he slow cooker so keep your fingers crossed for me. Have a great Lundi Gras!! We have a small but growing selection of vegan and vegetarian options in NOLA. We have plenty of ethnic options that are vegetarian (African, Mediterranean, Vietnamese, Honduran, etc), but I am most excited about that we now have two vegan restaurants. O! Vegasm serves some traditional NOLA food such as etouffee and other great bar food type stuff. Wandering Buddha is vegan Korean. Both of these new spots are delicious! Green Goddess has fancy and super tasty vegetarian food in the quarter. There are plenty of other places that provide options, you just have to dig a little! Thanks, Kerrie! I mentioned in the comments above that I was using neworleansgreen.com for restaurant ideas. The trouble is, when you’re in the CBD, effectively without a car because of the parades, on Monday and Tuesday of Mardi Gras, there are very few places that are open or that you can walk to. Unfortunately, I didn’t get to visit either of the two totally vegan places, but I look forward to next time! I hope you continue to enjoy your time in New Orleans. 🙂 I also find oily, roux-based sauces off-putting; they tend to feel too heavy and, well, oily. What a fantastic idea to dry-toast the flour instead of cooking it with fat! Susan, thank you so much for posting this while you are in NOLA. I am going to the store shortly and will be making it tomorrow while wearing my Fat Tuesday shirt and beads. I love your site so much. Thank you for making my transition so easy and tasty. Have a great time. when i went to New Orleans for Mardi Gras ages ago, there was nothing vegetarian to be found and some restaurants that did have veg options had special mardi gras menus to handle the crowds and there were no veggie options. No way could i have been vegan. I forget what i ate, but i know some breakfast food, plain pasta, etc. I know how hard it is to get around during Mardi Gras, but if you make it down to the Quarter, Gumbo Shop usually has a veg plate for the day. Gumbo, red beans and rice, etc… Back Uptown, Surrey’s is great. I miss them so much. They used to have an awesome eggplant muffuletta! In looking at their current menu, I see they do have a vegan french toast and other options. Susan, I just made this tonight. It was absolutely delish!! It’s still cooking, I just had to have a taste. The flavors were awsome. I was not disappointed. I made the sausages as well. They were so easy to make. That is what I like about the recipes you share. They aren’t time consuming and the ingredients are easy to find. Who knew you could make roux without oil?! This was delicious. Made it tonight since we’ll be away from the house on Fat Tuesday. I added a can of kidney beans and thought it rounded it out nicely. Thanks for all you do to make healthy eating so tasty. Susan (and the reader who mentioned using garbanzo bean flour), I make gravy regularly using chickpea flour and it really is deliciously gluten free. I can’t wait to try my hand at making this gluten free with tempeh and the chickpea flour. Sounds like a winner, and a great way to celebrate Mardi Gras. Thanks for the inspiration! This looks amazing! I love the idea of an oil-free roux. This looks delicious and so saucy! Love it and the lack of an oil-based roux. I made this and it was a huge hit! I used Trader Joe’s brand vegan sausage. It has much less fat than the Tofurkey brand and the taste is fantastic. I also added red beans to the rice. Thank you for your amazing recipes. I made this tonight and it was fabulous! But, I was terrified while browning the flour, as flour dust is known to be quite flammable and I have a gas cooktop. I managed to get the flour brown without burning my house down and I was very impressed with the depth of flavor that the browning provided. So glad to have learned this technique. Thank you! I’m from southern louisiana and this recipe sounds great can’t wait to try it. But an Étouffée does not have a roux. An Étouffée is light in color and sometimes a redish color. A stew or a gumbo has a roux and is dark in color. A stew is has a thick brownish gravy. A gumbo is a soup consistency made form a roux. I’m not a fan of unbleached white or wheat flours what do you recommend for a healthier option and also how can we slash the sodium content. It won’t be the same without flour, so I don’t really have a recommendation for making it without any flour at all. It’s the basis for the dark, smoky flavor, and without it, it will be a different dish. 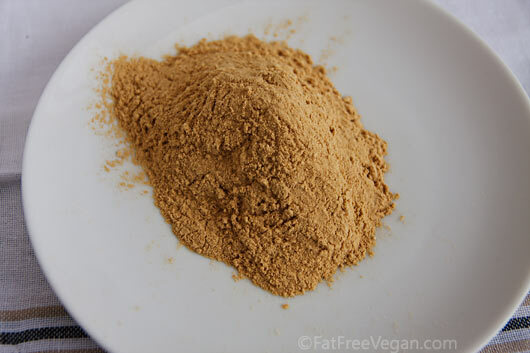 Someone in the comments above suggested chickpea flour as a substitute, and that might be a good substitute, but I haven’t tried it myself. The sodium comes mostly from the sausages (872mg), so if you use something else, like tofu or beans, you can eliminate of lot of it. The broth is the second largest contributor of sodium (225mg), so if you use a different brand or homemade, you can lower it there, too. Just made it. It was delicious! No changes needed. Way surpassed our expectations, just needed to double the recipe because there were no leftovers! This was my first visit to your site, I’ll definitely be back. I’m a newly experimenting vegan/no oil cook. Love your recipes….New to vegetarian cooking and your expand my horizons when it comes to foods I love…and mostly fat free…yes even being vegetarian I have to watch what I eat..calories seem to love me…but your recipes…Wow!!! I get satified with really good foods…thank you.. This looks very good and interesting to me as well. I have a grandchild of mine that is married and they both are vegan. I’m be watching there child this weekend which is my great grandchild. I’m thinking I will run into town to buy the ingredients at whole foods to make this recipe this weekend for all of us. I have been a vegen since 1970. It was a lot harder to make up recipies. there were not a lot of veggie products to buy either. LOve all your Recipes. I really haven’t measured much I thow a little of this and that so I think I will measue some of my recipes and pass them on to you. Think you might like some of them. Soups are my speciality. Thanks for the great dishes. This recipe looks great! If only my husband would eat anything with mushrooms in it. And I’ve had good luck using toasted chickpea flour as a roux! Made this last night. It was delicious. I added some chopped tomatoes to deepen the flavor. A big hit. I did not have some of the ingredients: celery, vegetable broth, or soy sauce. I have to say everything came out fine. I just used extra spices and it was wonderful. My family wants this to be in permanent rotation. This recipe looks so good, going to have to give it a try! I went to New Orleans once about 1.5 years ago and had pretty slim pickings as a vegan! I must say I made this for fat Tuesday along with the red beans recipe and it was AMAZING! Thank you for everything you do. I made this last night, to the letter, and it couldn’t have turned out better. The sauce was so thick and rich, and the flavours were perfect. A definite keeper! I really love your recipes and want to make this for dinner tomorrow and hoping it’s a hit with the kids! Any suggestions on turning the gimme lean ground “beef” into sausage to use here? Missing too many ingredients to make yours this round. This is how I would use Gimme Lean: slice it about 1/2 thick and pan fry the slices until brown on each side (you can do this with no oil or just pan spray). Then use the edge of a spatula to cut each slice into quarters. Then use them in the recipe. It should be great and much lower in fat than Tofurky or the other packaged sausages. Hi, this recipe including the pictures definitely looks awesome that it makes me want to get my hands to work on the kitchen. Can’t wait to give it a try. But, can i use tofu instead of vegan sausage? Thanks a lot! I’m visiting from the Best Food Photography contest and dropped by to admire you photography skills. Love your Creole dish. Takes me back to Louisiana and that’s a good thing. Susan, you are a genius! This was an AMAZING dish. I made this on Saturday night and impressed the hell out of my date, who in the past he has done little more than scoff at the vegan lifestyle, saying that he could never enjoy a meal without meat. This was his first vegan meal and he loved it so much that he said he would happily eat more vegan meals in the future ;-). But seriously, I think I make recipes from your blog more than any other blog I read (which is like one hundred blogs), and every single thing I make is out-of-this-world good. I almost never comment on posts (sad, I know), but you have definitely made my life more delicious over the last few years. I am a huge fan! One of my favorite places to eat in New Orleans is the Praline Connection on Frenchmen. Their red beans and rice and their greens are vegetarian, and I’m pretty sure vegan. Next time you’re there, I’d check them out for sure! Susan I just made this tonight. THANK YOU! It was delicious! However, I am not a fan of fake meat at all. Neither is my husband. So next time we’ll double the gravy, veggies and mushrooms and call it a night. Seriously, I wanted so badly to have some french bread to sop up the sauce. Delicious! My East Texas born Daddy would have definitely approved. Just wanted to tell you how much my husband loves your Mexican Lasagna and the regular Lasagna. He can’t stop raving about it. Over the years I have converted him and he doesn’t eat any meat or dairy. He could not believe how good those two dishes are and he always loves what I cook. Thanks for being there. Would adding okra to this dish ruin it? I have some in the freezer and have zero experience with okra. Thanks so much for letting me know about your husband! I’m so glad to hear that he likes those dishes so much. I think if you add the okra after the onion and cook it for a few minutes with the onion before adding the other vegetables, it will probably be fine. Don’t add any liquid to it as it’s cooking or it could become too thick and slimy. If you try it, please let me know your results. I have been saving a package of Field Roast sausages in the freezer for a special treat. Tonight I thawed them out and made this. Delicious! Thank you so much for this recipe! Definitely worth saving that Field Roast. My boyfriend is a bit sensitive to hot spices so I used the low end of your suggested ranges for the red and white peppers, and it was just right. I might need to try making my own sausages now so that I can have this again soon. I just made this tonite!! Delicious!! I made it early so my night-shift husband could take it to work with him, but I nibbled along the way. I can’t wait for supper time! This recipe is wonderful. It’s simple to put together, and the flavor is outstanding. My husband loved it and wants me to make it again. Thanks so much for posting this recipe! My husband is from New Orleans, so when I saw this recipe I had to make it for him! It was absolutely fabulous. I made the sausage and the étouffée all in one afternoon, which was a lot of work but worth it. Next time I’ll make the sausage the day before. 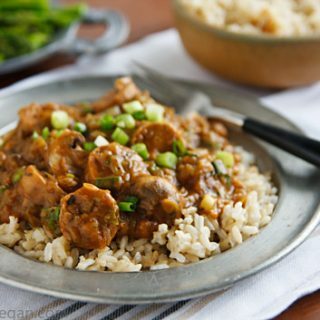 We just ate the sausage and mushroom étouffée for dinner with sauteed green beans and it was wonderful! I used brown rice flour, Feildroast apple sage vegan sausage, didn’t have smoked paprika so I subbed 2 parts paprika + 1 part cumin to get a smokier flavor. I used 1/4 tsp of the 3 peppers because I don’t handle spicy foods well and it was perfect. My fiancé, very much a meat eater, loved it! I can’t wait to make this for family and friends. Thank you! Made this tonight and it was delicious! I’m used to the étouffée with a base of a stick of butter and cream of celery soup. I’m glad to have a plant-based, and healthier version to replace my old favorite. The roux was delicious. I used tofurkey Italian sausages, but I think that I would experiment with other favors. Maybe even your fauxauges! I love your recipes and your website. It is my go-to website when I want to make something delicious and with flair!